SDSU and the Division of Student Affairs strive to develop leaders who believe in and work toward supporting civility, mutual respect and diversity in our society, the workplace and the world. Find cultural education workshops, training and events. Learn about Casa Azteca, serving San Ysidro commuter students. In 2000: 54.3% ~ In 2010: 59.5%. In 2003, Student Disability Services held SDSU’s first Disability Awareness Day. In 2005, SDSU was recognized for having more culturally based fraternities and sororities — including African-American, Asian-American, Asian/Pacific Islander, and Latino/Latina — than any other campus nationwide. In 2007, the Guardian Scholars Program was launched. EOP is the office that serves SDSU's Guardian Scholars, former foster-care youthwho are now on the road to a college education. The comprehensive system of support services helps meet the academic, social. career, emotional, and financial needs of these students. The program continues to grow, serving several homeless students as well, with comprehensive services including scholarships and year-round housing. 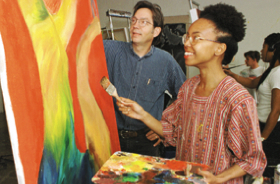 In 2008, the Office of Intercultural Relations/Cross-Cultural Center hosted the first annual SDSU Diversity Conference. In 2009, the award-winning Tunnel of Oppression celebrated its 10th anniversasry with more than 800 in attendance. In 2014, the 58th annual International Peace Village was held by the International Student Center in collaboration with the Associated Students. This international diversity festival allows international students to share their culture with participants through cultural displays, music, song, dance, costumes and performance. In 2010, SDSU was ranked 11th in the nation for bachelor’s degrees conferred to ethnic minorities and 6th in the nation for degrees conferred to Hispanics. To accommodate students who speak English as a second language, all Student Health Services exam rooms have access to interpreter services, via speakerphones. In addition, Student Health Services provides a Travel Medicine Clinic to current SDSU students who are prospective education abroad students, for safer travel abroad. Counseling & Psychological Services, in partnership with the Department of Women's Studies, took a lead role in creating SafeZones@SDSU. It works to ensure a campus atmosphere that is supportive, informative, and welcoming to lesbian, gay, bisexual, transgender, and questioning (LGBTQ) students and others in the SDSU community.